The most advanced, superior quality artificial turf available. DuPont™ ForeverLawn® Select Synthetic Grass has taken realism in Landscape grass to the next level. This innovative line of fine-bladed, lush synthetic grass features a tan thatch with multi-colored blades. 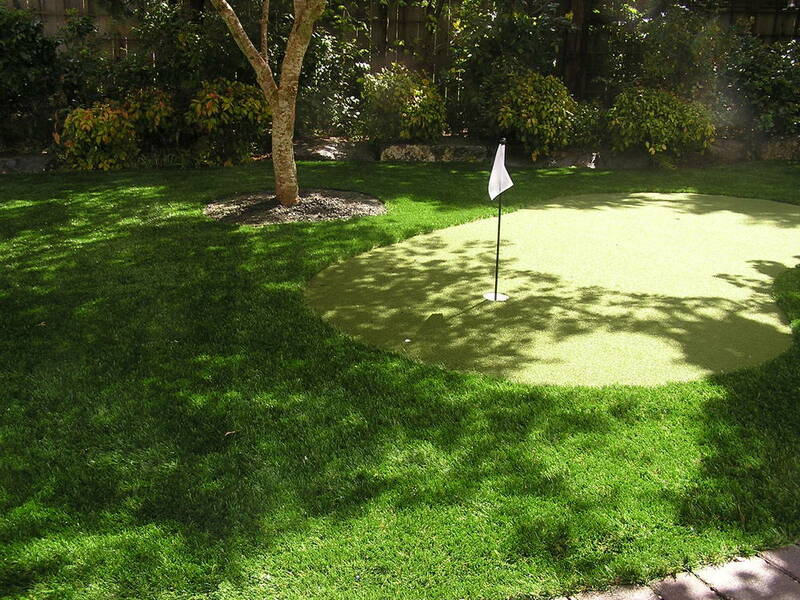 Whatever your golfing needs a GolfGreens by ForeverLawn can help you get more enjoyment out of your landscape. A revolutionary ASTM safety-rated surface that is safe for kids to play on, soft to fall on and cost effective. It's about performance. Far exceeding expectations, SportsGrass by ForeverLawn is taking sports fields to a new level. Say goodbye to cold concrete, gravel, mulch, muddy yards, and dirty paws! K9Grass is the solution you have been looking for. SplashGrass by ForeverLawn is a beautiful, safe, drainable synthetic grass that offers unique benefits for water play areas and landscaping within water parks. ForeverLawn of Puget Sound was honored to be part of the Rainier Kids Zone at Cheney Stadium. We would like to thank Play Creation, Korsmo Construction, The Baseball Club of Tacoma, and the Tacoma Rainiers for this opportunity. The wiffle ball field has made going out to a Tacoma Rainier's game even more fun. Enjoy a friendly game of wiffle ball before the game with other Rainier's fans! You might even find Rhubarb the Reindeer out fielding some balls or running the bases. We hope you enjoy the video which shows the project from start to completion. ForeverLawn: Perfect for Little Artists to Play on! Come May 22nd, the Artists at Play outdoor playground will be open at Seattle Center. Described as imaginative, creative, musical, and playful, the featured playground highlights the functionality and advantage of using ForeverLawn synthetic turf. This job encompasses what kids are supposed to play on! Our crew at ForeverLawn of Puget Sound installed a superior playground grass, meant specifically for the safety, durability, and attractiveness of playgrounds. With Playground Grass Ultra, the lightly textured blades and dense thatch resembles natural looking grass that is strong enough to withstand children’s play. ForeverLawn of Puget Sound is so grateful to have been a part of the Artists at Play outdoor playground. We are ecstatic that children visiting and living in the Seattle Center area have the opportunity to play on our premium synthetic turf. Safety, durability, and fun are main priorities for ForeverLawn. We truly believe this job conveys the functionality and longevity of our products. ForeverLawn of Puget Sound looks forward to seeing families at play this upcoming May at the Artists at Play outdoor playground at Seattle Center!